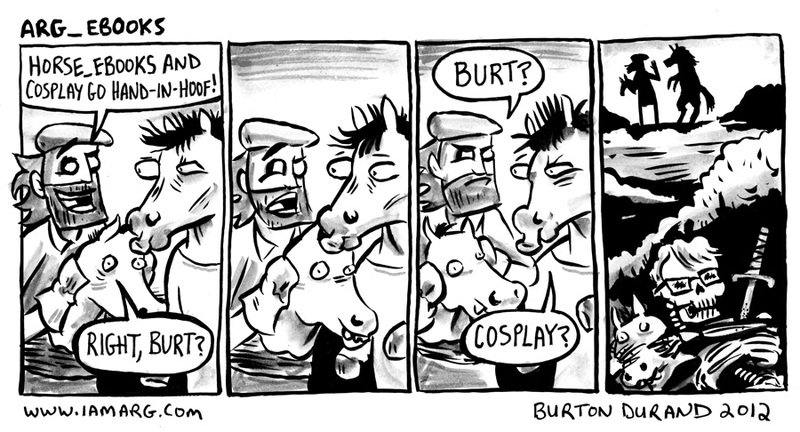 Today’s comic comes courtesy of Burton Durand of Horse_EComics! A hilarious comic strip that takes tweets made by @Horse_ebooks and creates comics based on them. I’m still in Lake Placid this week with very limited internet. If you need to contact me I reccommend you E Mail me. I will be checking and replying to that everyday. I only have 100mbs of internet which BLOWS… so I’m saving it for email and updating the site plus the occasional tweet. How long is that horse going to leave him hanging? …….. Well I’m going over to that city, so I’ll be back……………………….. never!!!!! Horrible truth: Arg killed Burt, and replaced him psychologically with a horse.